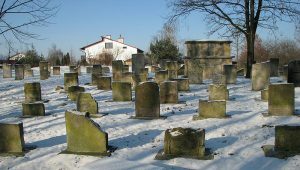 This entry was posted in General, Research, Uncategorised and tagged Holocaust, Poland, research, Staszow. Bookmark the permalink. hello! i am the son of bella zarhi whose name from home was forshteyer.she was from this town staszow. she came to what was then british mandate palestine in 1935. as a pioneer.she was a member of the hashomer hatsair youth movement.she was born in 1914 .she lost most of her family in the holocaust.she died at 2007 from a heart attack.she had an older brother moshe who lived in russia .i don’t remember when he died and i have no connection with his children.there was another brother who emigrated to argentina buenos aires.i don’t have any connection wit that family.all the other members of the family perished in the holoaucaust.holp holocaust.sincerly yours shlomo zarhi from ramat-gan israel.